How bad are things at the once-mighty Digg these days? Not so good. It’s been months since Digg relaunched in August in a quest for relevance. They had 18 million unique worldwide visitors that month according to Comscore. That dropped to just under 12 million in January, a 33% drop in just five months. Everything official coming out of Digg says things are great and that a the company will find a way to success. But everyone knows how unlikely that is. Even, it seems, founder Kevin Rose. He’s barely even using the service anymore. 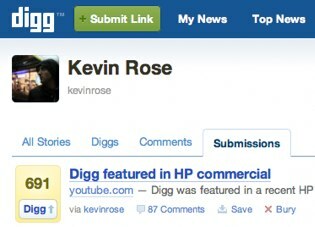 There was one 22 day period in December that he didn’t submit, comment on or even “digg” a single story. 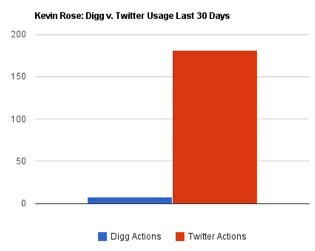 Over the last 30 days, he’s only had seven actions on Digg, less than one action every 4 days. He hasn’t submitted a story in over a month, on February 13. You can see his account here. It’s not much better with CEO Matt Williams, although he manages to Digg, comment or submit a story about once a day on average. In stark contrast, Rose is very active on Twitter, running up 181 tweets in the last month. He’s 26x more active on Twitter than the company he founded. There isn’t much chance for Digg to ever turn things around if the senior team, particularly Rose, aren’t even using the service any more. A sad fate for a once mighty startup.